From the DVD's "Main Menu" highlight the 'Extra Features' menu entry and then press your Right button. A yellow cat face will appear quickly that will then forward you to the hidden footage. 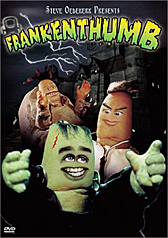 It is a funny 1-minute music and dance number by the Frankenthumb cast.